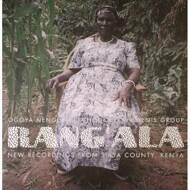 Open-hearted, fresh, lovely, bumptious recordings of women’s singing, from Rang’ala village in southwest Kenya. ‘Dodo’ is a type of traditional Luo music mostly used for entertainment at weddings, drinking parties and wrestling festivals. Songs in praise of the happy couple, the hardest drinkers and the best wrestlers. Ogoya Nengo was born in 1943. Her vocal abilities were discovered when she was herding cattle, as she never attended school, though nowadays her professional name signals both the Magoya clan of her birth and the fees she commands — ‘nengo’ meaning ‘price’ in Luo — as the most expensive Dodo performer on the circuit. Try the magical fourth song, Arum — about barking like a hornbill.